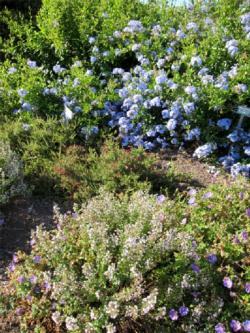 Blackie’s Pasture Garden in Tiburon was started in March 1995, at the suggestion of the Tiburon Peninsula Foundation, on approximately 0.5 of an acre of land situated in a former parking area. Three large mounds of construction landfill and a few tough native plants began the conversion process and led to what it has become today – a floral oasis with 100 cubic yards of topsoil and a complete drip irrigation system. 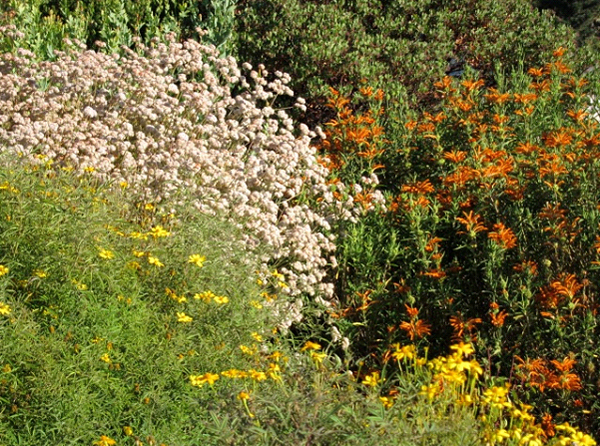 The pesticide-free, full-sun, public garden features approximately 2,500 drought-tolerant native plants. In addition to California natives, species from the Mediterranean areas of South Africa, Mexico and Australia have been added to give more color over the entire year. Plants have been identified with markers indicating the botanical and common names, and are updated regularly to help educate visitors to this easy-access garden. In the early 1990’s the entrance to Blackie’s Pasture was a mud hole in winter and a dust bowl in summer – an informal parking lot for bayside walkers. “Blackie’s Brigade”, a group of Tiburon volunteers, on several occasions, submitted a plan to the town to convert part of this desolate area into a garden. Each time the plan was rejected for lack of funds. Then the Tiburon Peninsula Foundation decided to help and volunteers chipped in to begin the project with donations of plowing assistance, compost and plants. In 1995 Harvey Rogers, a local Master Gardener, heard of the project and became involved. It wasn’t long until he had organized a larger band of volunteers comprising other Master Gardeners and gardening enthusiasts. With the natural environment and water conservation in mind, they developed a theme for the garden utilizing native plants. Over the years volunteers have given the garden their creativity, regular, ongoing care and loving attention. In 1997 a bronze plaque was unveiled honoring major donors and significant volunteers. Plants choices include natives that are deer-resistant, drought-tolerant, colorful and long blooming, sun-loving, and are of an appropriate size. A good water management irrigation system has been put in place although some of the plants need no summer water. In the hot months the drip system is supplemented by volunteers who water by hose once a week. Weeding by hand is needed, mostly in the rainy season. Work is provided entirely by volunteers – about 80% Marin Master Gardeners and 20% other interested citizens, mainly from Belvedere and Tiburon.